But by God, Eliot, it was a podcast from life. 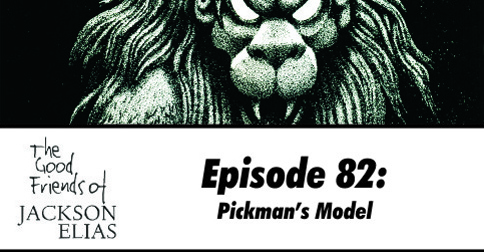 We’re back, and we’re digging deep into ancient crypts and forgotten sepulchres to bring you our impressions of Pickman’s Model. This is one of Lovecraft’s strongest and best-known stories, although it touches on few of the themes we normally associate with him. It is also ripe with inspiration, and we are not shy about cracking its bones and sucking out the juicy gaming marrow within. If you don’t normally read the show notes, please do this time, as they include photographs of the eldritch goodies sent to us by listener Frank Delventhal. And then, on the podcast, you can hear us unwrap them and puzzle through what exactly he did to those nails. We also have another installment of our fledgling Ask Jackson segment. Remember, if you have any questions about eldritch horrors, existential nightmares or matters of investigator etiquette, our unique position as the earthly vessels of Jackson Elias allows us to ask his advice on your behalf. Please post any burning questions you may have here. That’s figuratively burning questions only; we’ve had too many problems with the literal variety. There is also singing in this episode. Well, glibbering and meeping at least. It just happened that way.